The following are narrative summaries of significant sightings in 2013. For a searchable spreadsheet of all sightings in 2013, please see the Archives on the main Observations page. December invariably brings the excitement of CBCs and the possibility of rare ducks, gulls, and raptors, pushed south by severe weather to our north. This year, except for a brief cold snap at the beginning of the month, conditions remained unseasonably warm and dry—great for bird counters but not so good for birds and their habitats. Drought conditions limited food supplies and stressed many local birds. While overall species diversity appears to be unaffected, numbers of ducks and other northern breeding birds appear to be way down. In addition, there seems to be no sign of montane species irruptions that the region has experienced in previous years. We need rain! In MRN, a couple of Red-necked Grebes remained at Las Gallinas WTP through Dec. 14 (MF). Northern Fulmars congregated in impressive numbers off the SM coast, with 221 reported from a Dec. 4 seawatch from Pigeon Pt. and another 246 logged Dec. 21 from Pillar Pt. (RT, LBa). The same seawatches tallied 10 Pink-footed Shearwaters and a couple of Short-tailed Shearwaters. The pair of juvenile Blue-footed Boobies (Sula nebouxii) hung out on Gull Rock near Stinson Beach, MRN, at least through the 22nd (mob). 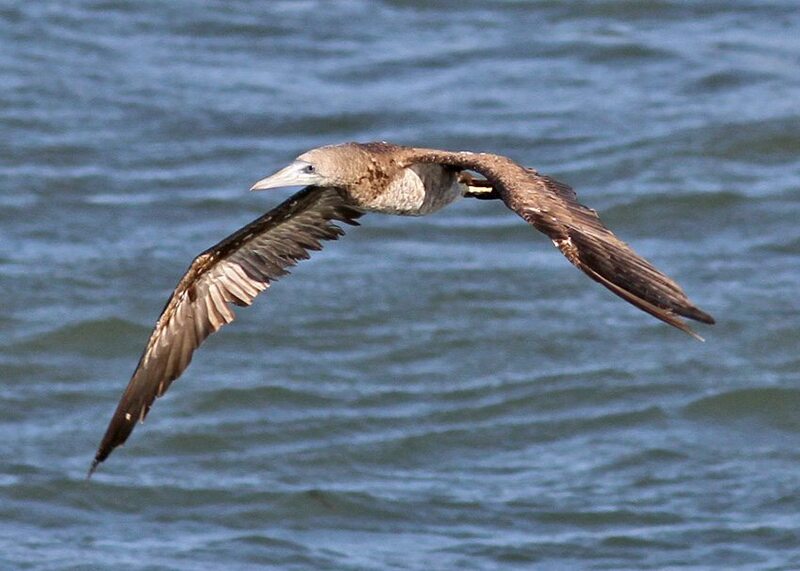 Also on the 22nd, a female Brown Booby was spotted heading north past Pillar Pt. Bluffs, SM (AJ). A few Cattle Egrets added to CBC tallies, turning up at Pleasanton Sports Park for the Eastern ALA County count on Dec. 20 (TB, YMh; mob) and at Coyote Cr. Golf Course and Kirby Cyn. Landfill for the Calero-Morgan Hill (SCL) CBC on the 28th (SR, fide AV). Visitors to Lagoon Valley Park near Fairfield, SOL, photographed 6 Trumpeter Swans (Cygnus buccinator) on Dec. 22; the birds lingered on the lake through the 29th (LaS, GS; mob). Fide JSt, there are very few records of this species south of the rice country in the Sacramento Valley and rarely a group this large south of the Klamath and Modoc basins in NE CA. A female Tufted Duck was ID’d on Dec. 13 at L. Merritt in Oakland, ALA (ST), where the male Tufted maintains its regular winter residence. Another male Tufted Duck was discovered Dec. 17–24 at Abbott’s Lagoon, PRNS, MRN (AT, SH; mob). Fide RT, the Coyote Pt. (SM) Harlequin Duck has now been in residence there for 12 years. Elsewhere, Harleys were noted on Dec. 23 at the S. Beach Yacht Club, SF (LHe); on Dec. 27 from Mori Pt., SM (BH, CL); and on Dec. 31 during a Great Highway seawatch in SF (HC, LiS, PS). A male White-winged Scoter returned to San Leandro Marina, ALA, beginning Dec. 18 (ZB; mob). Likewise, the returning male Black Scoter remained at the Richmond Marina in CC through the 24th (RiB; DH). The continuing female Long-tailed Duck at Pt. Emery in Emeryville, ALA, disappeared after Dec. 7 (mob). Elsewhere, Long-tailed Ducks were noted Dec. 13–30 at Pillar Pt. Harbor, SM (BK); on Dec. 21 during a Great Highway seawatch (PS); and on the 27th from Mori Pt. (BH, CL). A Common Black-Hawk (Buteogallus anthracinus) was reported from private property near Laguna Santa Rosa, SON, on Dec. 15 (fide BD). This is presumably the same bird that has been lurking at the Laguna since 2005. Beginning Dec. 4, a solo Mountain Plover joined 4 Pacific Golden-Plovers and a flock of Killdeer in a pasture along Pierce Pt. Rd. in PRNS (MDe; mob). The Mountain Plover lingered through the 16th, while the Golden-Plovers stuck through the 24th. Meanwhile, a Dec. 21 visit to the traditional winter stronghold for Mountain Plovers along Robinson and Flannery Rd. in SOL turned up only 6 birds (BG). A couple of overwintering Wandering Tattlers lingered through the 27th on the abandoned pier at Fort Mason, SF (DA), and a 3rd Tattler was reported on the 27th along San Quentin Shoreline, MRN (DaW). The Stilt Sandpiper that turned up at Hudeman Slough, SON, on Nov. 29th stayed put through Dec. (mob). Late movements of Red Phalaropes were noted the 1st week of Dec. with 80-pluss birds sighted from Bodega Head, SON (LHu; JSo), and another 30 noted from Pilarcitos Cr. in Half Moon Bay, SM (RT). A single Red Phalarope wandered inland Dec. 8 to Salt Pond A12, SCL (MM). At least 10 Glaucous Gulls moved south to the Bay Area for the winter, favoring coastal locations in SM, SF, and SON. As usual, the birds were mostly 1st cycle individuals. Noteworthy among the movements was a 2nd cycle gull discovered on the Dec. 15 Oakland CBC at Chuck Corica Golf Course on Bay Farm Island, ALA (LoK), and 2 1st cycle birds located at Clifton Court Forebay during the Dec. 17 Eastern CC CBC (KR, NC, SD). The surge of Ancient Murrelets that developed along the coast in late Nov. continued to increase through mid-Dec. with a high count of 175 on Dec. 13 during a Moss Beach seawatch, SM (RT). A pair of Spotted Owls was heard cackling to each other overhead in the pre-dawn of Dec. 29 at Bodega, SON (RR). Overwintering Short-eared Owls made appearances at Coyote Hills RP, ALA (KM, oob); Las Gallinas WTP, MRN (MDe); Laguna Ave. in Coyote Valley, SCL (RP, oob); Bodega Head, SON (MDo); and Bedwell Bayfront Park in Menlo Park, SM (RFe). The continuing Costa’s Hummingbird at Vasona L. CP in Los Gatos, SCL, survived the cold snap but was not reported after the 7th (mob). Sharp, well-trained ears led to the discovery of a Williamson’s Sapsucker on Dec. 21, drilling on a Monterey Pine at Crystal Springs Res., SM (GHa). Sapsucker watchers around the Bay noted 4 Yellow-bellied and 8 Red-naped or hybrid Sapsuckers this month, with birds showing a distinct preference for pepper trees and ripening persimmons. A pair of Eastern Phoebes at Collingwood and 22nd St. in SF could not be relocated after their initial discovery on the 21st (RuB). A Tropical Kingbird loitered Dec. 3–4 along the Richmond Bay Trail in CC (SG; MK), while 2 more Tropicals were 1 day wonders on Dec. 22 at Sierra Pt. Yacht Club in Brisbane, SM (LG, JF), and on Dec. 27 near Safe Harbor homeless shelter in S. SF, SM (BT, oob). A Cassin’s Kingbird at Hellyer Park, SCL, was a welcome addition to the Dec. 28 Calero-Morgan Hill CBC (PD). A Winter Wren at Giacomini Wetlands near Inverness Park, MRN, provided great comparisons to a neighboring Pacific Wren throughout the month (mob). Mountain Bluebird flocks remained along Patterson Pass Rd., ALA (mob), and between Mendoza (B) and Nunes (A) Ranches on outer PRNS, MRN (mob). A 3rd flock of 11 Mountain Bluebirds was located Dec. 15–31 in a pasture between Buchli Station and Milton Rds. in NAP (MB; mob). A Townsend’s Solitaire returned to Barth’s Retreat on Mt. Tamalpais, MRN (EC), by the 15th. The Gray Catbird at SF Botanical Gardens in GGP stuck to the Andean Cloud Forest all month (mob). The Bay Area entertained 2 Lucy’s Warblers this month: Nov. 25–Dec. 4 in the Linda Mar area of Pacifica, SM (LaK; JM), and Dec. 22–23 at the Bay Club tennis courts on Drumm St., SF (CA; mob). The Painted Redstart remained a local celebrity in the Elmwood neighborhood of Berkeley, ALA, throughout the month (mob). Two Black-and-white Warblers returned to HMB WTP in SM beginning the 20th (CH), and a 3rd Black-and-white Warbler was a nice Noe Valley (SF) yard list addition on the 22nd (AW). A Summer Tanager was reported Dec. 1–7 from Hippie Hill in GGP, SF, perhaps the same bird found the month before in Rhododendron Dell (AH; mob). Perhaps a 2nd Summer Tanager was located Dec. 7 near Stow L., GGP (MRK). A Clay-colored Sparrow continued through the 24th at Alemany Farm, SF (RFu). Another Clay-colored Sparrow spent the week of Dec. 2–9 at Miller-Knox RP, CC (KF; mob), and a 3rd sparrow turned up on the 21st along Old Lakeville No. 3 Rd., SON (RR). The latter bird was consolation for missing the Harris’s Sparrow, which had been reported from Old Lakeville No. 3 Rd. on the 19th (GHu, oob). A more cooperative Harris’s Sparrow joined a Zonotrichia flock in downtown Bolinas, MRN, on the 28th (KH, RDG). Visitors to the plover spot along Pierce Pt. Rd., PRNS, located a Chestnut-collared Longspur by ear beginning Dec. 5 (JE; fide LBl) and added 12–15 Lapland Longspurs beginning the 7th (MDe, RDG ; mob). Only 2 Rose-breasted Grosbeaks were reported this month: on Dec. 10 in Milpitas, SCL (MOB), and on the 27th in the Presidio, SF (IS). Eastern CC witnessed an influx of Yellow-headed Blackbirds with 100-plus on Dec. 2 at Big Break observation platform (LoK, DeW) and 30 more on the 17th at the Holland Tract (TR, oob). Last but not least, Orchard Orioles were ID’d Dec. 7–14 at Potrero Hill Community Garden, SF (K); Dec. 25–27 at Mountain L., SF (JC; oob); and Dec. 26 at Diekmann’s Store in Bodega Bay, SON (DF). A Yellow-billed Loon (Gavia adamsii) moved south ahead of winter weather, pausing Nov. 23–26 at Bodega Bay harbor, SON (GH, oob; RR). In MRN, a couple of Red-necked Grebes wandered from their preferred coastal locales to Las Gallinas WTP (MP; LBl, HN) and Corte Madera Cr. across from Niven Park (RC). Short-tailed Shearwaters increased in CA coastal waters with 25 individuals tallied on Nov. 15 off Bodega Head, SON (SC), and another 20 noted on the 21st heading north past Pigeon Pt., SM (RT). The SE Farallon’sNorthern Gannet (Morus bassanus) again made a coastal appearance on Nov. 3, roosting and then flying north from Gull Rock, MRN (CT). The statewide Blue-footed Booby (Sula nebouxii) influx abated somewhat in Nov., but 2 juveniles continued to claim Gull Rock as their home base through the 29th. 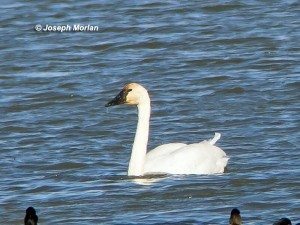 On Nov. 19–24, a couple of Tundra Swans wandered coastside from the Central Valley to Salt Pond A3W in Sunnyvale, SCL (SM; JL, MMm). A/the Tufted Duck returned Nov. 18 to L. Merritt in Oakland, ALA (KW; mob). A couple of Harlequin Ducks returned to their usual winter haunts on Drake’s Bay, PRNS, beginning Nov. 11 (DeH, DaH; DSi, JM), and a female Harley flew south with Surf Scoters past Pigeon Pt. on the 21st(RT). A/the Black Scoter returned Nov. 6 to the Richmond Marina, CC (AWL; HN). A female Long-tailed Duck joined the Bufflehead flock at Pt. Emery in Emeryville, ALA, beginning Nov. 27 (AM; mob). Seven more Long-tailed Ducks were reported from various coastal locales. An aerial Swainson’s Hawk passed over New Almaden township, SCL, on the 13th (JP, mob). A Rough-legged Hawk flew over Corona Hill, SF, Nov. 6 (DM). Rough-leggeds were also reported from Jenner Headlands Preserve, SON (DB, mob); Dan Foley Park in Vallejo, SOL (DnW); Drake’s Beach, MRN (DSh, mob); Midway Rd., ALA (RC; mob); and Penngrove, SON (JC). On the heels of the Oct. 22 report of a Yellow Rail in Alviso, 2 more Yellow Rails were reported from SCL on the 13th: the 1st was well described by 2 observers at Sunnyvale WPCP (LS, GM); the 2nd unconfirmed bird was flushed from Fisher Cr. near Tulare Hill in S. San Jose (CE). A pair of Pacific Golden-Plovers remained at Doran RP at Bodega Bay, SON, through the 21st (LH, JS, oob). By Nov. 1, 30 Mountain Plovers returned to their traditional winter grounds in the fields SE of Robinson Rd. and Highway 113, SOL (LE; mob). A juvenile Bar-tailed Godwit (Limosa lapponica) joined the masses of Marbled Godwits on Salt Ponds A15 and A9, SCL, beginning Nov. 15 (MMm, LCr, MR; mob). It lingered only 3 days despite missing its right foot. A Ruff first reported at Hudeman Slough, SON, on Oct. 31 drew admirers through Nov. 25 (GH; mob). On the 29th, Ruff hunters turned up a Stilt Sandpiper instead (GH; ROD). A Nov. 4 sea watch from Moss Beach, SM, reported a Black-legged Kittiwake among the south-bound migrants (RT). As many as 8 Ancient Murrelets were tallied Nov. 15–22 from Bodega Head and the south harbor jetty at Bodega Bay, SON (SC; mob). A whopping 90 Ancient Murrelets were logged Nov. 26 from Pigeon Pt. (RT). The same locale produced a Horned Puffin on the 21st (RT). On Nov. 16, a Redwood City (SM) resident returned home to her condo on Shoreline Dr. to discover a Long-eared Owl sitting in a bottlebrush tree (LF; mob). A male Costa’s Hummingbird defended his Mexican sage patch in Vasona CP, SCL, through Nov. 30 (mob). On the 2nd, a Lewis’s Woodpecker flew over Cole Valley, SF (PS). Yellow-bellied Sapsuckers continued at Ed Levin CP, SCL (BM; mob); returned to Don Castro RRA, ALA (JE); and made a 1st appearance at Heaton Moor and Bernal Rd. in Coyote Valley, SCL (BR). At least 4 of 5 reported Red-naped Sapsuckers showed varying degrees of hybridization with Red-breasted Sapsuckers. Hybrids were reported Nov. 11 at Spring L., Santa Rosa, SON (GW, AWe); Nov. 17 in the Botanical Garden in GGP, SF (LCh); Nov. 27 at Elk Glen L., SF (LCh); and Nov. 30 along the Conn Cr. trail at L. Hennessey, NAP (MB). The 5th Red-naped report, from the 29th in Kentfield, MRN, made no mention of hybridization (BL). One birder gave thanks for an Eastern Phoebe on Nov. 28 at Newhall Community Park in Concord, CC, but competition with the local Black Phoebes apparently proved too much for the bird to stick around for other birders (AWL). On the 26th, a few birders were able to photograph a Dusky-capped Flycatcher (Myiarchus tuberculifer) at Hole-in-the-Head, Bodega Bay, SON (LH, JS, oob). A Winter Wren at Giacomini Wetlands Restoration Project near Inverness provided a 1st MRN county record beginning the 15th (TE; mob). On the 2nd, a lone Mountain Bluebird was discovered sitting on a fence line near Los Vaqueros Res., CC (MMr; oob). Beginning on the 9th, up to 15 bluebirds set up shop along Patterson Pass Rd. in ALA (ZB; mob). Another small flock claimed the pastures above Nunes (A) Ranch, PRNS, MRN, beginning the 23rd (EC). A couple of Townsend’s Solitaires returned to the summit of Mt. St. Helena, NAP and SON, on Nov. 10 (AWi), and a 3rd Solitaire turned up on Corona Hill, SF, on the 23rd (DM; mob). On Nov. 26, a birder in search of a Black-and-white Warbler at the Botanical Garden in GGP, SF, instead located a Gray Catbird (MVDB; mob). A Sage Thrasher patrolled the northern jetty at Coyote Pt., SM, Nov. 1–6 (MK; mob). A Red-throated Pipit joined its American cousins at Abbott’s Lagoon, PRNS, MRN, on Nov. 3 (LM, MDe, RDG, ME, CR). Lucy’s Warblers were discovered Nov. 2 in the sweet fennel patch along Gull Dr. in S. SF and on the 24th on Grove Street in Half Moon Bay, SM (RT, LBa). Beginning Nov. 13, a Painted Redstart on Woolsey St. in Berkeley, ALA, drew the birding paparazzi to this Elmwood neighborhood to watch it glean at sapsucker wells (KBe; mob). A Blackburnian Warbler made a Nov. 23 appearance at PRNS Fish Docks (MDo, K). Best of the rest included 8 Palm and 3 Black-and-white Warblers and 2 Northern Waterthrush. A Summer Tanager was spotted Nov. 17 in the Rhododendron Dell at GGP, SF (LK). Another Summer Tanager joined the Yellow-rumped Warbler hordes at Hole-in-the-Head in Bodega Bay, Nov. 25–27 (DeH, DaH; mob). An American Tree Sparrow was well studied Nov. 2–12 among a large mixed-sparrow flock at Giacomini Wetlands, Pt. Reyes Station, MRN (DSh; mob). A Brewer’s Sparrow appeared Nov. 9 along Gull Dr. in S. SF, SM (RT, LBa). A Vesper Sparrow joined the Savannah Sparrow flock along Pierce Pt. Rd. in PRNS, MRN, Nov. 13–21 (DSi; mob). Another Vesper Sparrow did the same along Pigeon Pt. Rd., SM (RT). A Nelson’s Sparrow revealed itself during high tide on Nov. 21 at William Page Shields Marsh in Inverness Park, MRN (DF). 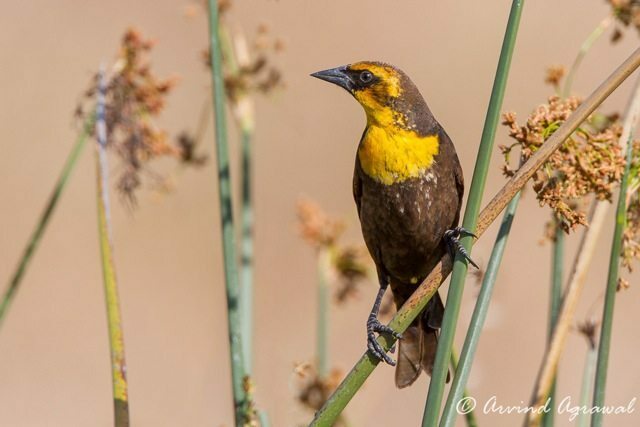 A Yellow-headed Blackbird visited the Vargas Plateau in Hayward, ALA, on Nov. 9 (BT). On Nov. 17, a probable Rusty Blackbird (Euphagus carolinus) was well described at the Teal Pond on Pierce Pt. Rd., MRN (EC). An adult female Rusty Blackbird (Euphagus carolinus) entertained numerous birders Nov. 23–26 as it fed along the water’s edge at Rodeo Lagoon, MRN (DvW, WL; mob). A Baltimore Oriole lingered Nov. 25–27 along the Guadalupe River trail north of Coleman Rd., SCL (JP; KBu). The season’s first Evening Grosbeak returned Nov. 9 to Mango Ave. in Sunnyvale, SCL (AKS). On the 12th, a 2nd Evening Grosbeak was located at Fort Mason Community Garden, SF (DA). Sometimes lightning strikes twice. Pelagic birders departing Half Moon Bay on Sept. 7 got quick but close-up looks of a Great Shearwater (Puffinus gravis) in SF waters over Pioneer Sea Cyn. (AJ, oob). This 2nd county record came less than a month after the 1st record. The Oct. 18 pelagic trip to Bodega Cyn. (SON) and Cordell Bank (MRN) located 2 Short-tailed Shearwaters (DS, oob), and a 3rd Short-tailed joined a Flesh-footed and a swarm of Sooty Shearwaters in a feeding frenzy off Pigeon Pt. Lighthouse, SM, on the 25th (RT). One or more Manx Shearwaters frequented SM and SF waters in Sep., showing off for boat trips on the 9th and 14th (DS, PJM , oob), and approaching land near Pigeon Pt. Lighthouse on the 22nd (RT, LB). The Sep. 20 Cordell Bank pelagic trip discovered an unprecedented concentration of Storm-Petrels, including 10,500 Ashy, 6,500 Fork-tailed, 300 Black, and 25 Wilson’s Storm-Petrels (DS, PP, SHo, oob). Onshore on Sep. 9, a pursuing Peregrine Falcon punished a Black Storm-Petrel for wandering into the Bodega Bay harbor, SON (LK, JS; oob). The Northern Gannet (Morus bassanus) continued to impress visitors to Sugarloaf Rock on SE Farallon Island, SF, where it has apparently set up a permanent base (mob). More intriguingly, landlubbers found that the bird occasionally roosts on Gull Rock, between Stinson Beach and Muir Beach, MRN (RCl, oob). Despite our growing familiarity with the Gannet, Sulid fever continued unabated, fueled by a Blue-footed Booby (Sula nebouxii) invasion. Boobies started turning up in Southern California around Sep. 8 and by the 11th the 1st bird made it to local waters, showing up at PRNS Lighthouse and Chimney Rock, MRN (RH, MBu; mob). For the next 2 weeks, boobies were reported on a regular basis along the coast, with as many as 3 birds appearing at a time, mostly juveniles but a few adults, mostly traveling north or fishing in the company of Brown Pelicans. Good lookout points included Bodega Head in SON; Outer PRNS in MRN; Sutro Baths and Cliff House in SF; and Moss Beach and Pigeon Pt. in SM. By Sep. 24 the Booby action began to abate, but 2 juveniles remained ensconced at Gull Rock through Oct. 31. 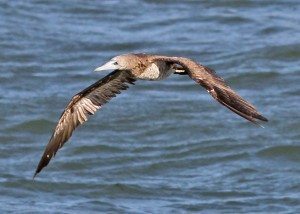 Largely overlooked in the Blue-footed excitement was a Brown Booby that was observed Oct. 7 from Hayward RS, ALA (BR), and a 2nd Brown Booby found on the 18th in MRN and SON waters during a pelagic trip to Bodega Cyn. and Cordell Bank (DS, oob). On Oct. 22, an employee at the Alviso Don Edwards Refuge Center, SCL, found a Yellow Rail that had decided that the parking lot looked like pretty good habitat (GK). East winds on Oct. 4 blew Sandhill Cranes into the region, with a small flock seen high in flight over Dublin, ALA (SHu); 2 or more in western MRN, including Pine Gulch (TP, JM), at Rodeo Lagoon (JoC, RF, JW, DW; WL), and in flight over Mt. Tam, MRN (MF); 4 airborne over Battery Godfrey, SF (mob); and 1 at Palo Alto Flood Control Basin, SCL (RJ, MM, FT, MR). In addition to Shollenberger Park, SON, Pacific Golden-Plovers made brief stops beginning Oct. 13 at Gazos Beach, Pigeon Pt., and Cowell-Purisima coastal trail, SM (GHa, RT, MDF, CH); Abbott’s Lagoon, MRN (EC, TP; DS); and Bodega Marine Lab and Doran Park, Bodega Bay, SON (DW; mob). On Sep. 16, careful study of a Golden-Plover at Spud Pt., Bodega Bay, SON, determined the bird to be an American Golden-Plover(Pluvialis dominica) (BD, KB, DF, GHu). A shorebird search at Huichica Cr. 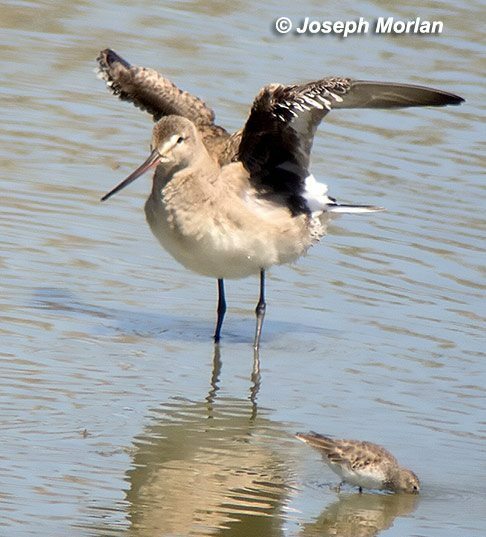 WA, NAP, on Sep. 11 produced a juvenile Hudsonian Godwit (Limosa haemastica) (MBe; mob). This 1st NAP record lingered at the ranch pond and adjacent marsh through the 24th. Between Oct. 9 and 17, a juvenile Ruff made periodic visits to the Crab Cove Visitor’s Center in ALA, ALA, to forage in the mud exposed at low tide (AF; mob). On Sep. 19, one of the birds flying south past Hayward’s Landing, ALA, turned out to be a Pomarine Jaeger (BR). A few Sabine’s Gulls were seen from shore in FS, including an injured subadult that took refuge in the dunes of Crissy Field on Sep. 9 (MZ) and a migrant passing the Oceanside WPCP on Oct. 26 (DMo). An Ancient Murrelet was noted flying north past Fort Funston, SF, on Oct. 5 (DMu). White-winged Doves were reported Sep. 7 from Nob Hill Market pond in Redwood Shores, SM (RT, LB), and Sep. 30 from Drake’s Beach, PRNS, MRN (STu). Heavy migrant action at UC Davis Putah Cr. Riparian Reserve, SOL, on Sep. 2 included a Yellow-billed Cuckoo (RR). On Oct. 6, careful study of the swallow/swift flock migrating over Bolinas Lagoon, MRN, located a Chimney Swift among the Vaux’s (PP, oob). A Williamson’s Sapsucker was a one-day wonder on Oct. 12 at Lobos Dunes in the Presidio, SF (PS). The season’s 1st Yellow-bellied Sapsuckers arrived Oct. 18 at Ed Levin Spring Valley area, SCL (GZ; DW), and the 29th at Water Lane, Pescadero, SM (RT). Likewise, the 1st Red-naped Sapsucker was reported Oct. 7 from McClellan Ranch in Cupertino, SCL (fide BP). A Least Flycatcher was photographed Sep. 28 along King Ridge Rd., SON (MP, RLB, LH, AW). A Gray Flycatcher was a nice bonus bird for the Sep. 7 hawk watch in the MRN Headlands (RCi, JB). On Oct. 26, a Vermilion Flycatcher brightened up Pescadero Marsh, SM (JTh). SE Farallon Island, SF, produces too many noteworthy records to report them all here but a Great Crested Flycatcher (Myiarchus crinitus) on Oct. 10 was the 1st island record since 1989 (JRT). A wren located on Oct. 11 at Lands End, SF, showed all the visual and aural diagnostics of a Winter Wren (JoC). Beginning Oct. 2, a few Sage Thrashers wandered out to the coast, appearing at Quarry Parking area of Coyote Hills RP, ALA (JTi; mob); Calero CP, SCL (KDM, TS, JH); and Laguna Ave. in Coyote Valley, SCL (DN; mob). An Asian Pipit invasion began Oct. 19 with the discovery of 3 Red-throated and 1 Siberian Pipit at Arrowhead Marsh, MLK Jr. Regional Shoreline, Oakland, ALA (JuC; mob), along with another Red-throated Pipit on the 26th at Bedwell Bayfront Park, SM (KS). Siberian Pipit is currently classified as the japonicussubspecies of American Pipit. Fall migration brought a Virginia’s Warbler to Sunnyvale WPCP, SCL, Sep. 24–26 (RK, PK; mob). A male Black-throated Blue Warbler became a local celebrity at Owl Cyn. in Bodega Bay, SON, Oct. 11–22 (MP; mob), while a female evaded all admirers but one on Oct. 13 at Fitzgerald Marine Reserve, SM (RT). A couple of Blackburnian Warblers and a Prairie Warbler lingered Sep. 28–30 at PRNS Fishdocks, MRN (JP, oob; mob). Another Prairie Warbler was located on Strawberry Hill in GGP, SF, on Sep. 29 (fide DMo; mob). Canada Warblers were early vagrants, arriving Sep. 2 at Sunnyvale Baylands, SCL (STr, GZ ; DW, mob); Sep. 7 at Hole in the Head, Bodega Bay, SON (MP, BTo; mob); and Sep. 14 at the PBCS banding station at Redwood Cr. in Muir Beach, MRN (RCo, oob). Best of the rest included 14 Tennessee Warblers; 2 Northern Parulas; and 5 Chestnut-sided, 16 Palm, 10 Blackpoll, and 6 Black-and-white Warblers; 11 American Redstarts; and 9 Northern Waterthrush. A hatch-year Black-chinned Sparrow was banded on Sep. 26 at the PBCS Palomarin Field Station, MRN (fide MD). A Lark Bunting paused Oct. 22–23 at Berkeley Meadows, ALA (AM, JiC; ZB). Both Chestnut-collared and Lapland Longspurs were discovered Oct. 5 at Mt. Trashmore Hayward RS, ALA (BR). Laplands were also reported from Pt. Reyes–Petaluma Rd. and Abbott’s Lagoon, MRN (JE, EC, TP); Bodega Head, SON (SC); and Johnston House in Half Moon Bay, SM (RT). An immature Painted Bunting was located Sep. 7–8 foraging on grass seeds at PRNS Fishdocks, MRN (JiC, DH; mob). Up to 3 Bobolinks joined the blackbird flock at Crissy Field in the Presidio, SF, Sep. 9–12 (CL; mob). Bobolink #4 appeared Sep. 22 on the Colwell-Purissima trail south of Half Moon Bay, SM (PLT), and #5 drew visitors to Oyster Bay RP, ALA, for a week beginning Oct. 24 (NA; mob). Pelagic birding started to heat up this month with the star of the show being a Great Shearwater (Puffinus gravis) that was well documented on an Aug. 11 pelagic trip to the Farallon Islands, SF (AJ; mob). If accepted, this bird would be the first state record north of MTY and just the 5th record overall. In other pelagic news, the season’s 1st Flesh-footed Shearwater sighting came from an Aug. 17 pelagic trip from Half Moon Bay, SF (DS; mob). Several trips to the Farallones confirmed the continuing presence of the Northern Gannet(Morus bassanus) on Sugarloaf. Back at shore. An Ashy Storm-Petrel approached the coast near Sutro Baths, SF, on Aug. 21 (BF). Up to 8 White-faced Ibis over-summered all month in the salt ponds and sloughs of Sunnyvale, SCL (AA, BB, DW). The over-summering Harlequin Duck at Pescadero Beach, SM, remained through at least Aug. 17 (BM; mob). A Pacific Golden-Plover paused on Aug. 5 at the old Oliver salt ponds, Hayward RS, ALA (BR). Another Pacific Golden-Plover returned to its traditional haunts at Shollenberger Park, SON, beginning Aug. 13 (LH; DM). A Solitary Sandpiper laid over Aug. 19–20 at Seal Pt. Park in SM, SM (RT; AE). A Ruddy Turnstone remained a local celebrity at Salt Pond A16, SCL, through Aug. 8 (MM). A Jul. 31 eBird checklist from Coyote Hills RP, ALA, included both Stilt Sandpiper and Ruff. The Ruff was refound by only a couple birders through Aug. 2 (ME; BT), whereas a number of birders enjoyed the Stilt Sandpiper through the 4th (ME, MP; mob). Shorebird migration brought an influx of 10 Wandering Tattlers, 10 Semipalmated Sandpipers, and 9 Baird’s Sandpipers. Beginning Aug. 17, Common Terns returned to their favored ALA roosts at Oakland Middle Harbor (MP); Ballena Bay (MR; PB); and Elsie Roemer Bird Sanctuary (BC). Black Terns also got into the action, with solo birds at Salt Pond A2E, SCL, Aug. 2–14 (DP; mob); at Foster City shell bar, SM, on Aug. 13 (LV); and at Johnson’s Landing along Hayward RS, ALA, Aug. 14 (BR). Out at sea, a couple Scripps’s Murrelets delighted birders on the Aug. 18 pelagic trip from Half Moon Bay, SF (DS; mob). Up to 4 Black Swifts were located in flight over Año Nuevo SR, SM, Aug. 9–10 (AJ; RT, LB). Dispersing Black-chinned Hummingbirds turned up throughout the month at Alamitos Cr. trail, SCL (JP); at the Wildlife Gallery in Bolinas, MRN (KH); along the Guadalupe River Channel, SCL (AV); at Coyote Hills RP, ALA (JT); at a Novato feeder, MRN (ML); and at the Sunnyvale Baylands, SCL (DW). An Oak Titmouse was a rare SF visitor to the Presidio Hills, Aug. 24–31 (RB; mob). Fall warblers began to trickle through the region, with vagrants tallying 1 Tennessee Warbler, 1 Blackpoll Warbler, 1 Black-and-white Warbler, 2 American Redstarts, and 1 Northern Waterthrush. As usual, vagrants were almost exclusively located at coastal migrant traps. A couple Rose-breasted Grosbeaks also turned up on Aug. 7 at a private feeder in Ladera, SM (fide MD), and on Aug. 25 along Lands End trail, SF (BAS). A male Indigo Bunting associated with a female Lazuli Bunting at Hole in the Head at Bodega Bay, SON, Aug. 25–27 (SC; mob). A calling Bobolink was a flyover ID atop Mt. Davidson, SF, on Aug. 20 (DM). A Yellow-headed Blackbird joined a flock of Brewer’s Blackbirds, Brown-headed Cowbirds, and European Starlings at Crissy Field in the Presidio, SF, on Aug. 19 (KS; CL, MP). Orchard Orioles were ID’d at 5 locales: Fort Mason, SF (DA; MK); McNear Brickyard, MRN (RS); a private feeder in Half Moon Bay, SM (JR, PM; oob); and Diekman’s Store and Hole in the Head at Bodega Bay, SON (PC, RR, DH). July in California is often referred to as the birding doldrums. Breeding birds are quiet, their nesting efforts nearing an end, but migrants haven’t really started moving yet. This month’s observations reflected that pattern—few truly rare birds but early signs of migration activity that is sure to pick up. A land-based seawatch from Pigeon Pt., SM, on Jul. 20 yielded 3 Pink-footed Shearwaters among the 200+ Sooty Shearwaters offshore (GH). A pelagic boat out of Half Moon Bay on the 21st photographed a Manx Shearwater in SM waters (AJ, PLT; oob). On the 25th, an Ashy Storm-Petrel wandered into the bay at least as far as Hayward RS at Frank’s Dump, ALA (BR). The recurring Brown Booby was spotted again on Jul. 4 off Ocean Beach, SF (JC). Remnants of the spring invasion, 5 White-faced Ibis lingered Jul. 3–27 at Sunnyvale WPCP, SCL (FH, AR, AH; mob). A few unseasonal ducks turned up around the region, including a Greater White-fronted Goose on Jul. 1 at Laguna de Santa Rosa, SON (LH); a Blue-winged Teal on Jul. 20 at Pillar Pt. pond, SM (MDF, CH); and Common Goldeneyes on Jul. 10 and 16 at Shollenberger Park, SON (SC) and Oakland Middle Harbor, ALA (MP). Oversummering Harlequin Ducks remained at Pescadero Beach, SM (BB), and at PRNS Fishdocks, MRN (RH). This spring produced a noteworthy incursion of Black Rails to the S. Bay, where their vocalizations continued Jul. 6 along Artesian Slough at Salt Pond A16, Alviso, SCL (PD), and Jul. 16 near Salt Pond A12, SCL (GR). It remains to be seen whether this activity points to colonization of new nesting territories. Southbound Wandering Tattlers began showing up starting Jul. 12 with sightings along Powell Street in Emeryville, ALA (JCh); on Doran jetty at Bodega Bay, SON (RB); and on Pillar Pt. jetty, SM (DPo, oob; CD). A rare visitor to the S. Bay, a Ruddy Turnstone was ID’d Jul. 24 on Salt Pond A16 and New Chicago Marsh, SCL (BB; mob). Semipalmated Sandpipers began arriving Jul. 16 at Brazil Beach, Tomales Bay, MRN (DS); Shollenberger Park (LH; RS); New Chicago Marsh, SCL (LC, MMm); and Charleston Slough, SCL (DPe). The season’s first Pectoral Sandpipers arrived Jul. 26 and 28 at Pilarcitos Cr. mouth, SM (MDF, CH; DPo, DPe), and New Chicago Marsh (SR). An adult Stilt Sandpiper in worn alternate plumage entertained visitors to Shollenberger Park Jul. 10–22 (SC; mob). A worn Red Phalarope attracted notice on Jul. 21 at Rodeo Lagoon, MRN (DW, WL). Beginning Jul. 28, SCL recorded its first Pigeon Guillemot, a juvenile bird in apparent good health on Salt Pond A14 in Alviso (RJ, MMm, SR; mob). A Purple Martin was spotted Jul. 17 near the nesting snags along Loma Prieta Rd. at Summit Rd., SCL (BB). A juvenile Purple Martin on Jul. 31 suggested possible nesting activity in the vicinity of Monte Bello OSP, SCL (GH). Also of local nesting note, an adult and 2 juvenile Canyon Wrens were located Jul. 16–17 atop Mission Peak in Fremont, ALA (DD; JT). A male Magnolia Warbler on Jul. 14 was a late vagrant visitor to Bercut Equitation Field in GGP, SF (DF). An unseasonal Yellow-rumped Warbler was reported on Jul. 15 at Coyote Pt. Yacht Club, SM (RT). A Jul. 8 visit to Nunes (A) Ranch, PRNS, MRN, produced an American Redstart (RH). 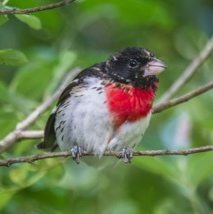 A few Rose-breasted Grosbeaks lingered in the Bay Area through July, including birds at Mt. Vision Rd. in Inverness, MRN (AD); at Rhododendron Dell, GGP, SF (LK); and at a private residence in Mill Valley, MRN (LFW). The Vasona L. (SCL) Baltimore Oriole continued through Jul. 9 (KB). Three Lawrence’s Goldfinches were the reward for birding the Rossmoor Golf Course, CC, on Jul. 15 (MMr). A calling Evening Grosbeak flew over a private residence in SF on Jul. 3 (JCl). Huge flocks of Sooty Shearwaters that had gathered on Monterey Bay moved north on June 20, when more than 16,000 cruised past Pigeon Pt., SM (RT). The spring invasion of White-faced Ibises abated somewhat in June with 5 birds reported on the 13th at Coyote Hills RP, ALA (JT); up to 17 individuals June 18–29 at Lockheed Martin marsh at Sunnyvale WPCP, SCL (DC; mob); and single birds at 3 more S. Bay locations. A Harlequin Duck added to the June 7 warbler festivities at PRNS Fishdocks, MRN (EC; DE, oob). An unseasonal Hooded Merganser lingered at Ocean Colony in Half Moon Bay, SM, through June 21 (GD). A Prairie Falcon pair successfully nested at Black Diamond Mines, CC, where adults and 2 fledglings were reported beginning June 5 (TF; JA). A couple of Black Rails were regularly heard calling June 6–27 in Alviso Slough at Salt Ponds A10 and A12, SCL (PD; mob). Another Black Rail call was reported June 20–22 from Bahia Marsh, Novato, MRN (ML). An adult Franklin’s Gull in alternate plumage joined the loafing gull flock at Pilarcitos Cr. in Half Moon Bay, SM, on June 6 (MDF and CH). On the 23rd, a Sabine’s Gull came ashore to a small pond along Ocean Beach, SF (HC). On the 9th, a Black Tern was noted fishing on Bolinas Lagoon, MRN (BBa). On the 27th, a Greater Roadrunner was noted cooing on a fence post along Hellyer Avenue, SCL (BBo). Spotted and Barred Owls were heard calling along Skaggs Spring Rd., SON, on June 19 (RR). On June 11, baseball fans got a glimpse of a Common Nighthawk flying over the A’s-Yankees game at the Oakland Coliseum, ALA (NA). In late June, several birders made evening hikes to the Pygmy Forest at Salt Pt. SP, SON, to confirm the return of Common Nighthawks to that locale (RR; mob). Three Black Swifts on June 8 flew along the ridgeline where Gazos Rd. meets Whitehouse Rd., SM, in patterns that suggested local nesting rather than migration (GHa). A Black Swift over the Larkfield area of Santa Rosa, SON, on June 14 was probably a late migrant (DS). Vaux’s Swift nesting was confirmed on June 21 at the McAbee Rd. entrance to Quicksilver CP, SCL, where a pair was observed entering a chimney near the park entrance and feeding young (AV, JP). On the 11th, an Eastern Kingbird was seen on a wire along Highway 1 south of Half Moon Bay, SM (RT, LB). A Purple Martin was a June 5 flyby at PRNS Lighthouse, MRN (PP). On the 6th, a female Martin acted like she was trying to find a nest cavity at Los Trancos OSP, SM (GHa). Three Purple Martins were tallied June 9 at the end of Mt. Umunhum Rd., SCL, where they reportedly nest at the summit (AV; GP, PW, BH). A Bank Swallow joined several Barn Swallows on the wires above Pillar Pt. pond, SM, on June 21 (AJ). A June 5 hike up Mt. St. Helena turned up 3 Mountain Chickadees in mixed Manzanita and Douglas fir along the SON portion of the trail (GHu). Beginning June 6, a Gray Catbird lingered 4 days at Nunes (A) Ranch, PRNS, MRN (MF, fide EC; mob). A Brown Thrasher was discovered June 2 frequenting fruiting red elderberry and blackberry bushes along Cloverdale Rd., SM (GHa). Vagrant warblers reached their typical early June maximum, with sightings concentrated at outer PRNS and Bodega Bay. Birders tallied 2 Northern Parulas; 2 Chestnut-sided, 1 Magnolia, 1 Blackpoll, 1 Black-and-white, and 1 Hooded Warbler; 5 American Redstarts; 3 Ovenbirds; and 1 Northern Waterthrush. A Hepatic Tanager was photographed atop Mt. Davidson on June 8, providing SF with its 1st city record (CMR). The next day a Summer Tanager was located at N. L. in GGP, SF (BD). A June 1 hike to the summit of Pine Mountain, MRN, in search of chaparral specialties was rewarded with a Green-tailed Towhee skulking in the brush (JE). As many as 15 Rose-breasted Grosbeaks were reported in the Bay Area this month, virtually all concentrated in coastal locations: 6 in west MRN (including 5 at outer PRNS), 5 in SF, 2 in SON, and 1 in SM. The sole inland sighting came from Pajaro River at Sargent Cr., SCL, on June 23 (DSu). A female Blue Grosbeak turned up on June 6 in the ravine below the parking area Pt. Bonita Lighthouse, MRN (DSi). The Cloverdale Rd. (SM) Indigo Bunting lingered until at least June 16 (mob). It was joined in the Bay Area by 4 more Indigo Buntings at Loma Alta Fire Rd. in San Rafael, MRN (DH, SB); PRNS Lighthouse, MRN (PP; PC); Valle Vista Staging Area in Moraga, CC (TH; mob); and La Honda Cr. OSP, SM (RT, LB). On June 5, a Yellow-headed Blackbird was espied behind the Lockheed pond next to the Sunnyvale Bay Trail, SCL (BM). A Scott’s Oriole was well described on June 12 at the PRNS Fishdocks, MRN (AH). A May 26 seawatch from Pigeon Pt. in SM reported 3 Pink-footed Shearwaters (MK). It appears that Brown Boobies may have staged a mini-invasion of NorCal waters this month, with up to 4 different birds reported between SM and MEN. A May 4 pelagic trip out of Half Moon Bay found a Brown Booby in SM waters (AJ, oob), followed by a May 8 report from a boat skipper of a possible 2nd bird, acting sick or waterlogged (DB, fide AJ). Meanwhile, starting May 6, an immature Brown Booby lingered a week at PRNS Lighthouse and Kehoe Beach, MRN (MF; mob) before relocating to Bodega Bay May 22–27 (JLu; mob), where it narrowly escaped death by fishing line entanglement. Photo comparisons confirmed that the MRN and SON sightings were the same bird but different from the SM and MEN sightings. There was nothing “mini” about the White-faced Ibis invasion this month. In SCL, flocks of 20–25 birds were reported on May 2 on Salt Pond A12 (PD) and on May 20 over Gilroy (DM). Also on May 20, 11 White-faced Ibis flew over and circled S. L. Merced, SF (BG). Less surprisingly, 10 White-faced Ibis continued along Jersey Island Rd., CC, through May 18 (JB; JEl). Ibis sightings in 1s and 3s were reported from 9 other locations around the bay. The Radio Rd. Eurasian Green-winged Teal, first reported on Apr. 10, remained in Redwood Shores, SM, through May 7 (RT). A couple of drake Redheads turned up May 18–19 on the upper pond at Pescadero Marsh, SM (GH; DP). A drake Long-tailed Duck showed off his alternate plumage at Drake’s Bay, PRNS, MRN, on May 12 (DW). Last month, this space noted a remarkable concentration of Swainson’s Hawks in Coyote Valley, SCL. This month, the concentration merely intensified, with a high count of 14 individuals reported on May 20, including a kettle of 7 over Richmond Ave. (RP; mob). It remains to be seen whether these birds will establish a regular breeding presence in Coyote Valley. Elsewhere, migrant Swainsons were reported from 9 locations in SM, SF, and SON. A sojourn up Rockpile Rd., SON, on May 3 was rewarded with a calling Sooty Grouse (TB). A calling Black Rail caught the attention of a May 14 visitor to Iron House Sanitary District, CC (JS). An alternate plumage Franklin’s Gull at Doran SP was a bonus bird for folks chasing the Bodega Bay Brown Booby on May 22–25 (JLa; mob). A Sabine’s Gull came to shore at Baker Beach, SF, on May 23 (MW). A half-dozen Black Terns joined the Least Tern flock at Huichica Wildlife Area, NAP, on May 11 (EC). Single Black Terns were observed May 21 at Salt Pond A17, SCL (PD) and on May 26 at Heron’s Head, SF (DA). The May 4 pelagic trip out of Half Moon Bay noted both Scripps’s and Ancient Murrelet in SM waters (AJ, oob). On May 6, a female Spotted Owl was heard whooping near the PRNS Lighthouse, MRN (TP). A couple of Barred Owl pairs provided call-and-response entertainment along the south fork of the Gualala River, SON, on May 28 (JW). Black Swifts moved through between May 19 and 27 with 10 individuals tallied along a southeastern ridge above NAP Valley, NAP (MB, RM, EP), and single birds noted in Coyote Valley (SR) and along Hwy 1 in SM (DS). Black-chinned Hummingbirds returned to traditional nesting areas along the Pajaro River, Coyote Cr., and Guadalupe River in SCL (DS, JP, MM) and on Bethel Island, CC (JB; JEl, oob). A late migrating Calliope Hummingbird followed the SOL/NAP county line north along Mix Cyn. Rd. on May 21 (RR). A Gray Flycatcher was out of range on the Pajaro River, SCL, on May 6 (DS). Cassin’s Kingbirds at the northern edge of their breeding range returned to their favorite eucalyptus tree along San Felipe Rd., SCL (TG). Vagrant warbler reports were scarce this month with just a couple of Palm Warblers at outer PRNS (JEv, JLu; DW); a Black-and-white Warbler in Bear Valley, PRNS (MAF, ES); and a Northern Waterthrush along Stevens Cr., SCL (MR). Yellow-breasted Chat movements continued all month with reports from Redwood Shores, SM (PB, RT, LB; MDF, CH); the Presidio, SF (SP; mob); Monte Bello OSP Gate 5, SCL (GH); Muir Beach, MRN (KS); Pajaro River, SCL (DS); L. del Valle, ALA (SH); Laguna de Santa Rosa in Sebastopol (LH; mob); and Valle Vista Staging Area, CC (TH). Clay-colored Sparrows are a scarce fall migrant in this area so it is noteworthy that 2 different sightings were reported this month: May 4 from Mt. Davidson, SF (CL) and May 13–14 in a patch of Myoporum shrubs at Bedwell Bayfront Park, SM (PM). A Brewer’s Sparrow turned up May 29 in Corona Heights, SF (DM; CL, BF). Nesting Black-chinned Sparrows returned to Prieta Rd. at Summit Rd., mostly on the SCZ side but occasionally straying into SCL (BR). In Henry Coe SP, a May 27 field survey discovered 9-plus Black-chinned Sparrows along Bear Mountain Rd. and County Line Rd. (MR, RJ). Starting May 14, Rose-breasted Grosbeaks showed up in Knights Valley, SON (RR); along Pomponio Cr. Rd., SM (RT; mob); at Fort Miley East, SF (HC); and at Almaden L., SCL (JP; mob). At least 4 Indigo Buntings made it to the Bay Area, including the continuing male on Mt. Burdell, MRN (JM; SC); a May 2 visitor to Mt. Davidson, SF (DM, oob); a singing male at Star Cr. Ranch (private property) in the Pajaro Hills, SCL (NL, AR); and another singing male on Cloverdale Rd., SM (GC, JD, SS, oob; mob). A singing male Baltimore Oriole drew admirers to Vasona L. CP and University Ave. in Los Gatos beginning May 15 (JP, KB, SR; mob). Singing Baltimore Orioles were also reported in SM on May 27 at Redwood Shores Parkway (RT, LB) and on Native Sons Rd., near Pescadero Rd. and the Butano Cutoff (DS). Red Crossbill flocks lingered through at least May 16 with 14 seen flying into SCL airspace from SM at Monte Bello OSP Gate 5 (GH); 18 in the pines about the Woodside camping area at Salt Pt. SP, SON (KM); and 35 cracking Bishop pinecones on Mt. Vision, PRNS (PeC). The Evening Grosbeak flocks in Sunnyvale have apparently moved on, but a solo male was active in Tilden RP, CC, on May 10, and a couple of females visited a Corte Madera feeder May 12–13 (NW). ’Tis the season of migration, when summer birds wax and winter birds wane. Birdathons proliferate, and Big Day competitors study their calendars, calculating which dates will maximize their counts. This spring saw Big Day records getting smashed far and wide. Team Sapsucker smashed the national record by 30 species on Apr. 25, with 294 species seen between Uvalde and Bolivar Flats, TX. In the Bay Area, the SCL record came and went several times, starting the season at 177, ratcheting up to Santa Clara Skimmers’ 179 (plus 2 out-of-county species for a national carbon-free record of 181) and ending at Rogers & Rottenborn’s 187. The S. Bay’s Red-necked Grebe relocated to Salt Pond A4 in Sunnyvale, SCL, where its breeding plumage was admired Apr. 17–22 (MAA, BMi; mob). A lone Cattle Egret appeared Apr. 1–5 at L. Elizabeth in Fremont, ALA (JT, VR; CAl). Considered a candidate for a species split, Eurasian Green-winged Teal were called out Mar. 13 at Nob Hill Market pond in Redwood Shores, SM (MDF, CH; MP); Apr. 3 at Crittenden Marsh, SCL (JCl, DKa, RF); Apr. 6 in the NAP-SON marsh, NAP (MB); and Apr. 10 at Radio Rd. in Redwood Shores, SM (RT). The Tufted Ducks at L. Merritt, Oakland, and L. Hennessey, NAP, cleared out by Mar. 31, but a hybrid Scaup x Tufted Duck remained lurking in a channel behind Marlin Street in Redwood Shores, SM, on Apr. 13 (RT, LeB). Swainson’s Hawks started migrating through on Mar. 24, with a high count on Apr. 16 of 5 birds over Coyote Valley, SCL (RP). Ferruginous Hawks lingered in SCL through Mar. 14 in Coyote Valley (AA, RP) and at Ed Levin CP (PD). The last Rough-legged Hawk report was Mar. 10 from Huichica Cr. unit of the NAP-SON marsh, NAP (MB). A Prairie Falcon was the highlight of an Apr. 21 sky-watch from Battery Godfrey, SF (PS, HC). Pilgrimages to the N. Bay’s high country were rewarded with calling Mountain Quail on Mar. 18 along Sage Cyn. Rd. (Hwy 128), NAP (DM), and on Apr. 24 along Pine Flat Rd. in Healdsburg, SON (JH). The Black Rail’s “keekeedrr” was reported Mar. 1 from the wetlands at Kearny St. in Benicia, SOL (DSw). The species was not heard again until Apr. 21–22 at Martinez RS, CC (LK), and China Camp SP, MRN (BN). On Mar. 17, beachgoers discovered a Sandhill Crane standing in a tide pool at Bean Hollow Beach, SM (AH). A Pacific Golden-Plover reappeared on Mar. 23 at its traditional haunts at Shollenberger Park, Petaluma, SON (HK, DKi, BD). Solitary Sandpipers moved through the area in April, with 9 sightings reported from the muddy edges of various ponds, creeks, and brackish marshes in the region. A Mar. 1 Wandering Tattler at Pillar Pt. Harbor, SM (SK), was the only Tattler report until Apr. 25 and 26, when migrants turned up at Sutro Baths, SF (BF), and at Bodega Head, SON (LH, oob). A Semipalmated Sandpiper joined a flock of Westerns on Apr. 10 along the Great Highway, SF (BF). A Baird’s Sandpiper was well described on Apr. 26 along Millerick Rd. near the ghost town of Wingo, SON (GHu). A flock of 15 Red Phalaropes passed northbound at Sutro Baths, SF, on Apr. 15 (BF). A 1st cycle Laughing Gull headed north on Apr. 11 over Ocean Beach, SF (DM). A 2nd cycle Kumlien’s Iceland Gull (Larus glaucoides) was ID’d Mar. 7 at the Pilarcitos Cr. gull roost in Half Moon Bay, SM (JCi). A handful of Black-legged Kittiwakes migrated north along the SM coast Mar. 1–9, spotted from Pilarcitos Cr. in Half Moon Bay (MDF, CH; DP, JCr); Pigeon Pt. (MK); and Pescadero SB (MK). The season’s 1st Common Tern was discovered Apr. 27 at Salt Pond A14 in Alviso, SCL (MM). A pair of Common Murres penetrated the Bay as far as Brooks Island in Richmond, CC, on Apr. 21 (LK, BMa). A Greater Roadrunner drew birding crowds to Deer Ridge Golf Course, CC, Apr. 3–13, where it has apparently resided for years (JCh; mob). Lingering Short-eared Owls were seen hunting through Mar. 10 at Palo Alto Flood Control Basin, SCL (TS, CS); NAP-SON marsh, NAP (MB); Coyote Valley, SCL (Arvind, AV); and Salt Pond A4 in Sunnyvale, SCL (RF). A late lingering or possibly nesting owl called on Apr. 21 from Martinez RS (LK, BMa). Migrant Calliope Hummingbirds moved through in mid-April, with a high count of 10 on Apr. 15 at Mitchell Cyn., Mt. Diablo SP, CC (LK, BMa; mob). Yellow-bellied Sapsuckers continued through mid-March in Ed Levin and Stevens Cr. CPs, SCL (mob), and at Don Castro RRA, ALA (JE). A 4th Sapsucker was ID’d Mar. 28 at Alpine L., SM (MDF, CH). The hybrid Red-naped x Red-breasted Sapsucker at Spring L. in Santa Rosa, SON, continued through Mar. 19 (mob). SF’s 2 Tropical Kingbirds loitered through Mar. 21 at India Basin Shoreline Park and through the 26th at S. L. Merced (mob). Oakland’s Tropical Kingbird, MIA since the CBC in Dec., reappeared Mar. 8–27 at MLK Jr. Shoreline’s Garretson Pt. (EB; mob). Beginning Apr. 9, Cassin’s Kingbirds returned to nest in the eucalyptus trees on San Felipe Rd., SCL (FV, BRe; BBo). Purple Martins reestablished their nest sites in snags near the ridge lines of Pine Flat Rd. in Healdsburg, SON (JH), and Summit Rd., SCL (BBo). Migrant Martins were reported beginning Apr. 10 from the ridges of Skyline Memorial Park, SM (RT); Nicasio Res., MRN (BBa); and Pine Mountain Rd., MRN (JM, oob). Townsend’s Solitaires continued through Mar. 9 on the flanks of Mt. Tamalpais, MRN (DSh, KS; mob), and another Solitaire was located Mar. 3 along the Center Flats Trail in Henry Coe SP, SCL (JY). The continuing Cape May Warbler (Dendroica tigrina) near East Bayshore and Embarcadero remained through Mar. 17 and obligingly crossed San Francisquito Cr. multiple times to contribute to the SM and SCL lists of its admirers (RT, LeB; mob). A 2nd Cape May was well described Apr. 21 at the Polo Fields in GGP, SF (DF). Through Apr. 21, the Pescadero Rd. Black-throated Blue Warbler was heard singing from its favorite perches at Dearborn Park Rd., SM (SK, GHa). A Black-and-white Warbler was located Mar. 6 along Willow Cr. Rd., SON (mob). Yellow-breasted Chats returned by Apr. 26 to their nesting territories along Llagas Cr. at the S. County Regional Wastewater Authority ponds, SCL (MM; FV, BRe). Migrants were detected Apr. 29 at Nicasio Valley Res., MRN (JM), and at N. L. Merced, SF (JCl, ZS, DM; mob). Harris’s Sparrows continued through Apr. 6 at Oka Ponds, SCL (BP, oob), and through Apr. 28 at Coyote Pt. Park, SM (RT; mob). By Apr. 21, a hybrid Rose-breasted x Black-headed Grosbeak returned to Gazos Cr. Rd., SM, where it has summered for several years (GHa; MK). By Apr. 27, Blue Grosbeaks returned to their traditional nesting sites along the Pajaro River between Hwy 101 and Sargent Cr., SCL (BBo; FV, BRe). A singing male Indigo Bunting was located Apr. 30 on Mt. Burdell in Novato, MRN (LH, oob; MRu). Lone Yellow-headed Blackbirds were noted Apr. 10 at L. Elizabeth, Fremont, ALA (CAl), and Apr. 17 at Hayward RS, ALA (BRi). Up to 5 Yellow-headed Blackbirds tarried Apr. 26–30 at Sunnyvale WPCP ponds, SCL (PD; mob). Like the Cape May Warbler, the female Baltimore Oriole near East Bayshore and Embarcadero entertained SM and SCL listers on both sides of San Francisquito Cr. through Mar. 17 (RT, LeB; mob). Another Baltimore Oriole visited a backyard feeder in the Central Richmond district, SF, on Apr. 12 (fide AW). Through Apr. 29, Evening Grosbeaks kept feeding on the remnants of the pistache berry crop in the Cherry Chase neighborhood in Sunnyvale, SCL (MS, oob). A flock of 14 Evening Grosbeak was spotted Apr. 14 flying into a live oak on the chaparral habitat west of Stevens Cyn. Rd., Stevens Cr. CP, SCL (RF). February was a good month to study gulls at herring runs and chase a number of continuing overwintering rarities. A Red-necked Grebe continued through Feb. 18 at Lower Crystal Springs Res., SM, where it was first discovered on Dec. 2 (JR; AE). Bayside Red-necked Grebes were also reported Feb. 23 at Bayfront Park, SM (GC), and Feb. 24 on Salt Pond A2E, SCL (PD). A Feb. 2 seawatch from Pigeon Pt., SM, produced a Black-vented Shearwater (RT). 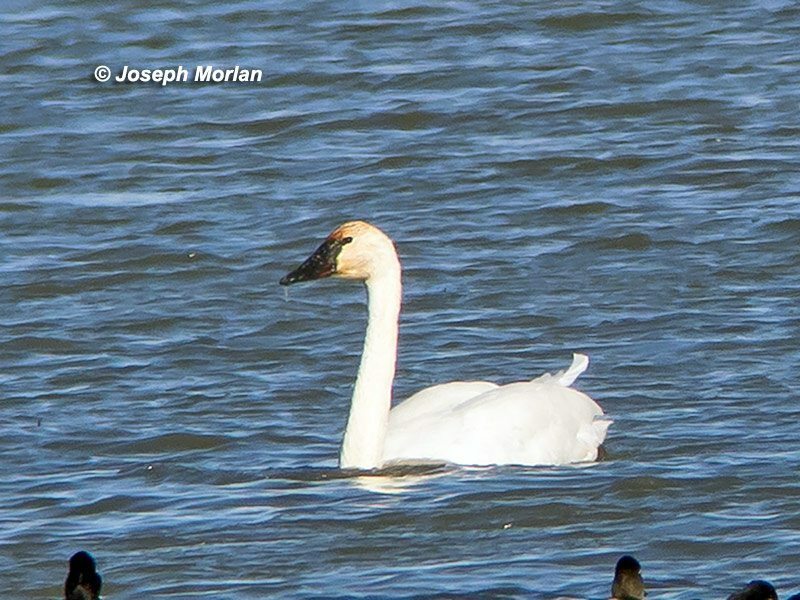 Five Tundra Swans were discovered grazing in a field north of Bloomfield Rd. near Gilroy, SCL, Feb. 6–25 (BBo; mob). The male Harlequin Duck at Pier 94, SF, lingered through Feb. 8 (mob), and a female was spotted off the east jetty in Bodega Bay, SON, on the 19th (GHu). The Richmond, CC, Black Scoter shifted over to Miller-Knox RP, Feb. 16–17, to take advantage of the herring run (TB; oob). At least 1 Long-tailed Duck stayed through Feb. 3 at Mile Rock, SF (DM). Two new Long-tailed Duck sightings came in Feb. 24 from Chimney Rock, PRNS, MRN (DE), and Feb. 27 from Emeryville Marina, ALA (NA, BBa; mob). A Black Rail continued calling through Feb. 8 at Las Gallinas Valley Sanitary District, MRN (BN). A Rock Sandpiper joined the rocky shorebird flock at Bodega Head, SON, Feb. 10–19, where it was seen mostly at high tide roosting on rocks below the whale lookout (DSh, SG, EV; mob). A fly-by Red Phalarope graced a Feb. 9 seawatch from Great Highway, SF (PS). The region’s biggest rarities this month came from the Larus genus, starting with a Kumlien’s Iceland Gull (Larus glaucoides), reported Feb. 12 from the Shell Bar in Foster City, SM (AJ). On Feb. 24, an adult Lesser Black-backed Gull (Larus fuscus) staked out the parking lot at the San Leandro Marina, ALA (NA). This would be a different bird from the one reported last month in Sausalito, which was a 2nd cycle individual. 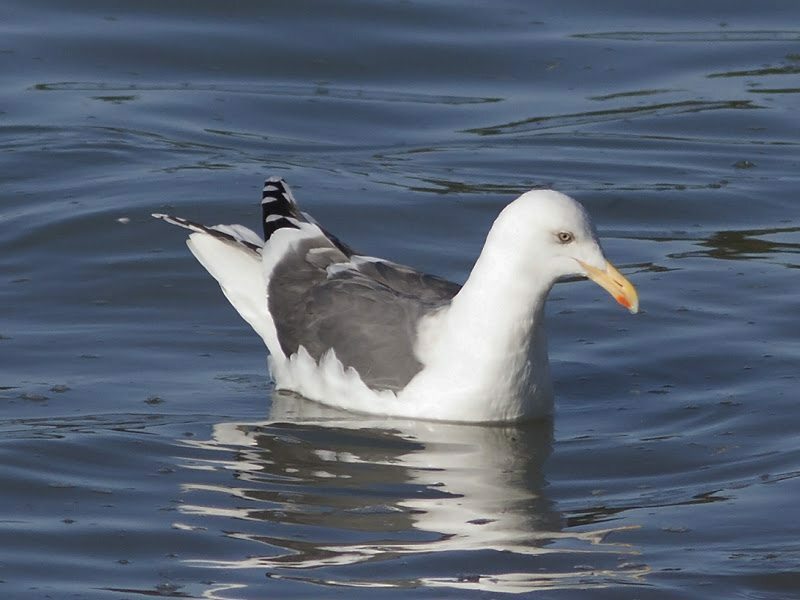 On the other hand, an adult Slaty-backed Gull (Larus schistisagus) that followed the herring to Miller-Knox RP, Feb. 8–13, proved to be the same bird found at the Sausalito herring run (MP, TE; NA, DSi). A north-bound Black-legged Kittiwake on Feb. 17 was an early migrant past Pigeon Pt., SM (RT, LeB). On the 4th, an Ancient Murrelet floated offshore at Ocean Blvd. in Moss Beach, SM (RT). A Common Poorwill that was first found near the Gazos Cr. Rd./Cloverdale intersection, SM, in Jan. was refound on the 11th. It and a 2nd Poorwill along the entrance road to Butano SP entertained evening visitors the rest of the month (CM, JS; mob). Yellow-bellied Sapsuckers continued all month at Ed Levin Park and Stevens Cr. CP, Cooley Picnic Area, SCL (mob). A 3rd SCL bird turned up on Feb. 3 at the Thompson Cr. wetlands at Quimby Rd. (AV). The L. Hennessey, NAP, Red-naped Sapsucker was last reported on Feb. 1 (MB), while the hybrid Red-naped x Red-breasted Sapsucker at Spring L. in Santa Rosa, SON, continued through Feb. 25 (KW, BO). Continuing with the continuation theme, Eastern Phoebes continued through the 11th at Los Capitancillos pond, SCL (mob), and through the 5th along Stage Rd. north of Pescadero, SM (BT). SF scored 2 Tropical Kingbirds: on the 8th at S. L. Merced (DM) and on the 23rd at India Basin Shoreline Park (LoB). A Winter Wren was ID’d by voice and recorded on Feb. 3 along Pescadero Rd. at Dearborn Park Rd., SM (AR, JG). A flock of 15 Mountain Bluebird brightened up Los Vaqueros watershed, CC, on Feb. 10 (CW, TW). Two Townsend’s Solitaires remained through the 27th in the Sargent Cypress grove near the Rock Springs trailhead on Mt. Tamalpais, MRN (mob). Another solitaire showed briefly on Feb. 9 along the Bear Valley Trail, PRNS, MRN (CS). The San Francisquito Cr. Cape May Warbler (Dendroica tigrina) stayed all month in its favorite flowering eucalyptus tree near East Bayshore and Embarcadero, SCL (mob). Likewise, the Pescadero Rd. Black-throated Blue Warbler stuck close to the sweetgum tree near Dearborn Park Rd., SM (mob). A new warbler for the region was Black-and-white Warbler, located Feb. 6–10 at the Botanical Gardens in GGP, SF (BG; KJ). Northern Waterthrush continued at Berkeley Aquatic Park, ALA (MR), and at Charleston Marsh in Mountain View, SCL (ST). A Los Gatos (SCL) feeder remained a favored stop for a Rose-breasted Grosbeak through Feb. 10 (LS). The female Baltimore Oriole was seen sporadically throughout the month at San Francisquito Cr. in Palo Alto (mob). Overwintering Bullock’s Orioles were reported Feb. 2 from Ulistac in SCL (KB, JP); Feb. 3 at Pedro Pt. in Pacifica, SM (JM); and Feb. 27 at Coyote Pt. Park, SM (RT). A Feb. 4 hike to the summit of Mt. Hood between Kenwood and Santa Rosa, SON, produced a flock of 6–9 Cassin’s Finches (LH; GHu). On the 18th, a Cassin’s Finch pair visited a feeder in Kenwood, MRN (RR). The Red Crossbill irruption continued apace with the largest flock reported as 27+ birds on Feb. 21 along Hobbs Rd. and Monument Trail, Henry Coe SP, SCL (BBo; oob). A single Lawrence’s Goldfinch lingered at the thistle feeder at Hidden Villa, SCL, through the 8th (GHa). Another Larry’s was observed Feb. 3 at the Cowell-Purissima trailhead, SM (EB). A flock of 9–12 Evening Grosbeaks stayed all month in the Cherry Chase neighborhood in Sunnyvale, SCL (mob). Additional individuals and flocks were reported from Page Mill Rd., SCL (FT); GGP, SF (LK); Pt. Reyes Station, MRN (JC; PC, KP); and San Francisquito Cr. (FT). January brought crisp but dry weather after weeks of rain, along with great opportunities to track down overwintering rarities from the winter CBCs. A Red-necked Grebe ranged inland to L. Elizabeth in Fremont, ALA, Jan. 17–23 (CA; mob). A flock of 16 Frigatebirds had been seen sporadically along the SoCal coast in Oct. so it was not a complete surprise that a probable Magnificent Frigatebird was noted on Jan. 20, soaring offshore from Abbott’s Lagoon, PRNS, MRN (MBu, MAR). A Common Teal was ID’d on Jan. 16 on a pond near Mitigation Marsh at MLK Jr. RS, ALA (BRi, EW). Currently considered the European subspecies of Green-winged Teal, it remains a candidate for splitting to full species status. A hybrid Tufted Duck x Scaup was discovered Jan. 5–6 at Piper Park in Larkspur, MRN (EC; LBl). While the L. Merritt Tufted Duck rewarded admirers all month, a Tufted Duck on the NAP Sewage Ponds was a 1-day wonder Jan. 14 (DeH, DaH). Harlequin Ducks made sporadic appearances at Mile Rock, SF, on the 10th (AH); at Mussel Rock in Pacifica, SM, on the 15th (GD); and at Pescadero Cr. Mouth, SM, on the 21st (KJ). A couple of White-winged Scoters returned to their regular bayside retreat at San Leandro Marina, ALA, starting Jan. 10 (VR; mob). A Black Scoter remained in winter residence at the Richmond Marina and a 2nd Black Scoter joined the duck flocks in search of herring roe at Bay Farm Island, ALA, on the 31st (NA). A female Long-tailed Duck spent the month patrolling the waters of the First Street Pier in Benicia, SOL (EP; TF). Two more Long-tailed Ducks lingered off Mile Rock, SF (BF; mob). The most unusual raptor sightings were 2 reports of immature Swainson’s Hawks, first on Jan. 5 from PRNS Headquarters in Bear Valley, MRN (TP, TW), and then on Jan. 20 from Battery Godfrey, SF (PS). A Jan. 26 trek up Bald Mt. in Sugarloaf Ridge SP, SON, was rewarded with a Mountain Quail (GHu). High tide at Corte Madera Marsh, MRN, on Jan. 11 drove a Black Rail into the open (JM). At Las Gallinas Valley Sanitary District, MRN, a Black Rail was heard calling on the 26th (BN). A 2nd cycle Lesser Black-backed Gull (Larus fuscus) joined a massive gull influx on Jan. 22–23 in response to the herring run along the Sausalito shoreline, MRN (DS; LK). The same herring run on the Tiburon side of Richardson Bay attracted an adult Slaty-backed Gull (Larus schistisagus) on Jan. 23–25 (DS, MP, STu; TE, JS, SH). Another adult Slaty-backed Gull was located Jan. 27 at the Pilarcitos Cr. gull roost in Half Moon Bay, SM (GC). Glaucous Gull sightings picked up this month, with 7 sightings in ALA, MRN, SCL, SF, and SM. A Black-legged Kittiwake was spotted from Bodega Head, SON, on Jan. 25, along with 5 Ancient Murrelets (SC). A half-dozen Ancient Murrelets were also recorded on Jan. 5 from Pescadero Cr. Mouth, SM (GC). On Jan. 10, a Long-eared Owl was discovered roosting at Las Gallinas Valley Sanitary District, where it subsequently met its demise in the talons of a Red-tailed Hawk (MBe; mob). An owling trip to Gazos Cr. Rd., SM, on the 12th was rewarded with a Long-eared Owl calling in the distance (JRy). A birder driving Cloverdale Rd. near Pescadero, SM, on the evening of the 18th had to swerve to avoid hitting a Common Poorwill (GHa; RT, LBa). A hike up Monument Trail in Henry Coe SP, SCL, led to discovery of a male Williamson’s Sapsucker on the 3rd (BB). Yellow-bellied Sapsuckers continued at Ed Levin Park, SCL, and Don Castro RRA, ALA, and new individuals were located at Stevens Cr. CP, SCL (RK; mob); Inverness, MRN (TP); and Pichetti Ranch OSP, SCL (CY). The Jan. 2 Angwin CBC reported a Red-naped Sapsucker at L. Hennessey, NAP (fide MuB; mob); a 2nd bird was reported Jan 17 in Palo Alto, SCL (DK). An odd-looking sapsucker along Coyote Cr. Trail, SCL, on Jan. 16 proved to be a hybrid Red-naped x Red-breasted Sapsucker (BH). Eastern Phoebes maintained winter residence along Stage Rd., north of Pescadero, SM, and along the Guadalupe River Trail at Taylor St., SCL. Eastern Phoebes also turned up on Jan. 7 at Los Capitancillos Ponds in Almaden, SCL (AV) and on Jan. 24 on East Railroad Ave. in Petaluma, SON (GHu). At least 15 Mountain Bluebirds returned to their winter haunts along Patterson Pass Rd., ALA, where they were noted on Jan. 2 (MRa). As of Jan. 26, at least 1 Townsend Solitaire persisted among the Sargent Cypress trees near Barth’s retreat, Mt. Tamalpais, MRN, and a new Solitaire spot was discovered on Bald Mt. in Sugarloaf Ridge SP, SON (GHu). 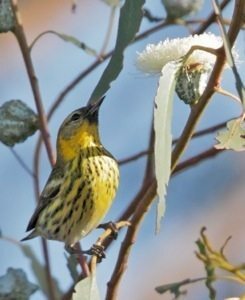 An adult male Cape May Warbler (Dendroica tigrina) was discovered Jan. 21–31 foraging around eucalyptus blossoms on San Francisquito Cr. at East Bayshore in Palo Alto, SCL (JF, LG; mob). The continuing Black-throated Blue Warbler remained all month in the vicinity of Pescadero Rd. at Dearborn Park Rd., SM. Overwintering Western Tanagers were located in Sunnyvale, SCL (MRo); in SON, SON (CH, AC); in Santa Rosa, SON (BO, fide KW); and in Glen Park, SF (KS). A Clay-colored Sparrow made the yard list on Jan. 2 at a Fulton Street address in Berkeley, ALA (BMN). Continuing Harris’s Sparrows awaited spring near Cordelia Junction, SOL, and at Oka Ponds, SCL. A 3rd Harris’s Sparrow joined a mixed sparrow flock at Coyote Pt. Park, SM, beginning the 15th (RT; mob). A Lapland Longspur was located by call on Jan. 28 at Huichica Cr. WA, NAP (DM, MP). A Rose-breasted Grosbeak continued its regular visits to a Los Gatos feeder, SCL, through the 25th (LS). A male Indigo Bunting was discovered on the 19th hanging out in the sidewalk planters in SF’s Parkside District (DM). A male Yellow-headed Blackbird was photographed Jan. 2 at Coyote Hills RP, ALA (RD, JT). A female Baltimore Oriole visited the Cape May Warbler eucalyptus along San Francisquito Cr. on the 24th (JS, fide STe). An overwintering Bullock’s Oriole was located Jan. 11 at Diekmann’s Store, Bodega Bay, SON (DF). High counts this month for Red Crossbills were 40 on Jan. 24 in Henry Coe SP, SCL (BB; MRo, BRe, FV, MM), and 30 on the 31st in Bodega Bay, SON (PH, PW). A sole male Lawrence’s Goldfinch discovered the thistle feeder at Hidden Villa, SCL, Jan. 22–29 (LR). Evening Grosbeaks remained concentrated in the S. Bay communities with lots of pistache trees, particularly Sunnyvale, Los Altos, Palo Alto, and Mountain View.